When reading magazines or newspapers, you may notice that they contain a lot of ads, and using magazine advertisements is actually a very effective marketing strategy. When making advertisements for a certain product, service, or even for the company itself, you need to make sure it reaches a large number of audiences either by itself or by word of mouth. When an advertisement is able to cover a wide radius, the greater number of people will be informed about what is being advertised, which, in turn, will be able to gather a greater number of prospects, which is a good thing. Advertising can be done in so many ways. In the modern sense, you may be able to take advantage of the Internet and social media websites for advertisement purposes, which actually requires a lesser amount of work and is able to get the job done in the least amount of time possible. However, even in this digital age, the traditional method still prevails not only because the older generation aren’t that much knowledgeable in the use of computers, but because people can see the effort made in making these advertisement tools. With this, you can choose to go with flyers, brochures, posters, banners, or rack cards to advertise your products and services. While this may require you to do an extra amount of effort, with our designs we can assure you that all your efforts will pay off. Speaking of rack cards, we have an entire collection of rack card designs below that you can download and use for advertisement purposes. Many of these designs are intended for advertisement of specific products and services, while some are generic and can be used for anything. Though it doesn’t mean that just because a design is for a specific product, it can no longer be used for something else. All of these designs are fully customizable and can actually be used for anything. Go ahead and check out the rack card designs below to get you started. Check out this first rack card design on our list, it is intended to be used to advertise a cupcake shop and their products as evidenced by the image of a mouthwatering cupcake vector in the middle of the design. 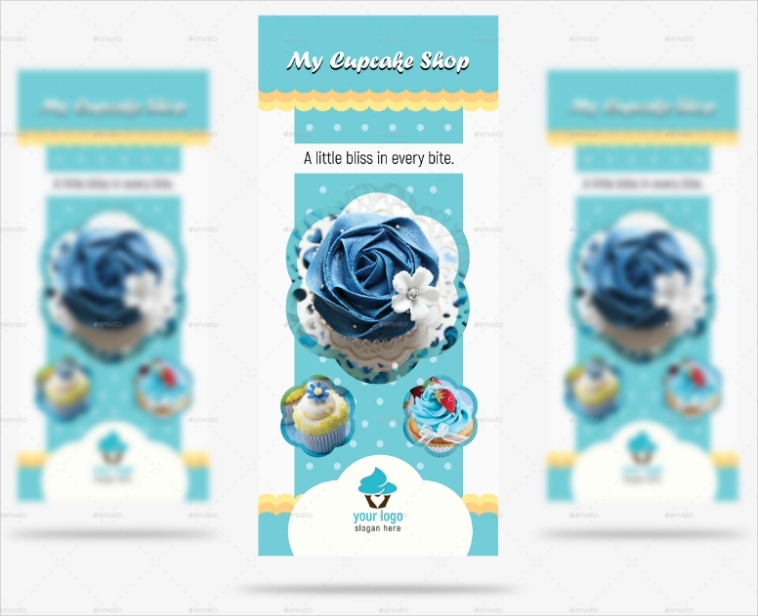 This rack card design uses a blue color scheme, which perfectly suits the color of the cupcake, and depending on the color of your elements, you may also stick to the scheme or you may also use a contrasting color scheme to make the elements stand out even more. For photographers out there who are looking for prospects in very easy ways, you may always make an online portfolio that shows all of the photographs, but you can also go the traditional way and leave copies of rack cards in places commonly visited by people. 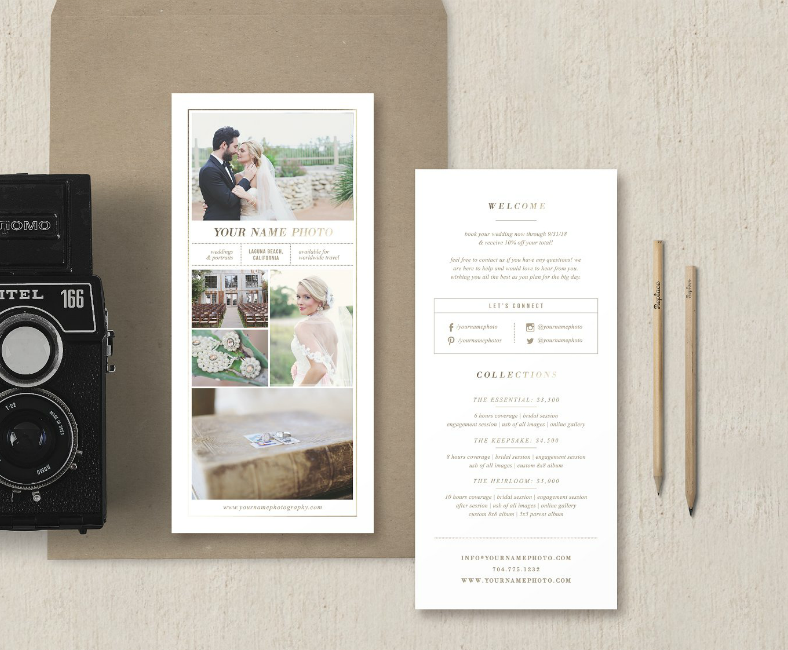 Similar to when you’re designing photography flyers, make sure to include only the best photos to effectively capture the attention from people, and don’t forget to include the Web address or a QR code to redirect prospects to your online portfolio. Medical insurance has always been and will always be an important tool to protect people from financial loss or with financial assistance during urgent situations. Let’s take medical or health insurances, for example, they are very beneficial to provide people with financial support during hospitalizations and medical emergencies. With life insurances, while it may not be able to benefit the insured themselves, it will help that person’s surviving family members by providing them with financial assistance as well. Promoting the importance of insurance should be done very effectively and should always be an eye-opener to people who are unaware of its benefits. As you can see on the rack card design shown above, it provides answers to the most common questions that people ask in terms of insurances. On the bottom portion of this design, space is provided where the advertisers may be able to indicate their contact details. In this small piece of card, make the most out of it by providing as much information as possible. Being healthy is more than just regular exercise, it’s also about choosing the right type of foods to eat and consuming only the amount required for your body. Ever since we started going to school, we have always been taught to keep away from junk foods, which include sodas and candies, and to eat healthy foods such as fruits and vegetables. As we grow older, we start to realize the health benefits of these healthy foods as we ourselves start to feel them or compare ourselves to those who are more into consuming unhealthy foods. The design above does not advertise a specific brand or their product; however, it advertises fruits and vegetables as evidenced by the food illustrations, as well as a list of their benefits. This rack card design provides enough space for you to write down what you need to fully encourage people to be healthy. 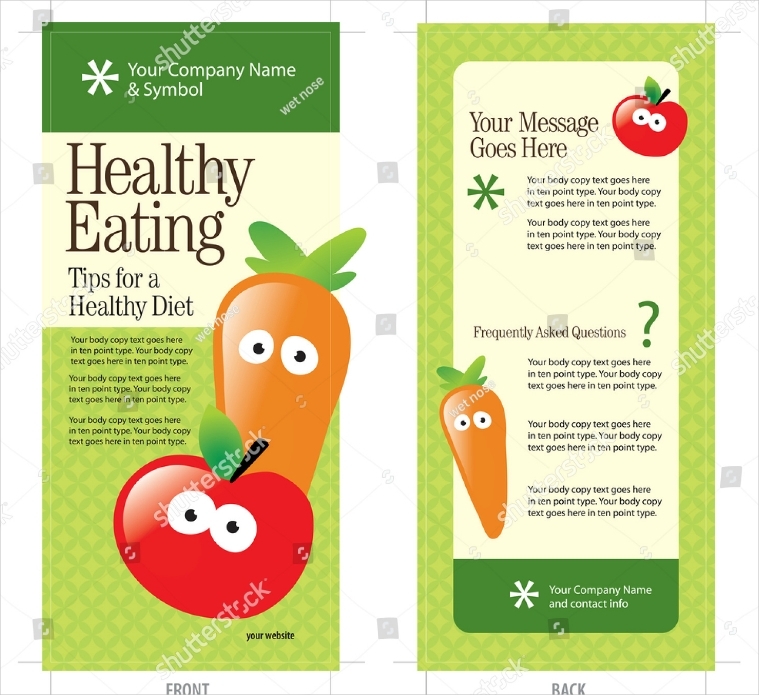 As you can see on the sample above, the front side of the card has a space where you may be able to enumerate some tips on how to eat healthy. The back side, on the other hand, has a space for you to write down some answers to some frequently asked questions regarding this matter. 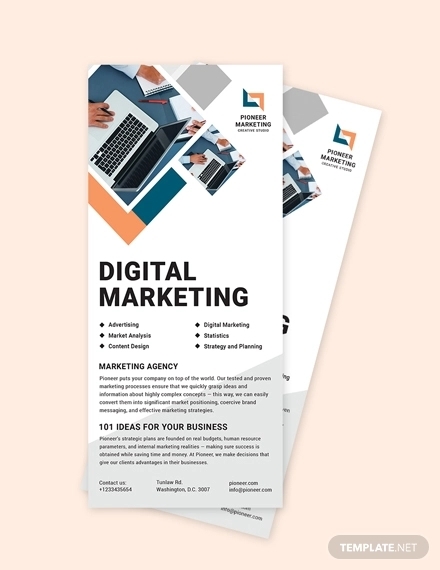 Rack cards are small documents or tools that are being used for marketing or promoting a product or service to the public. These cards are often seen being displayed in hotel lobbies, restaurants, convenience stores, landmarks, and many other locations that are commonly being visited or passed by a large number of people. Rack cards commonly have a 4-inch by 9-inch dimension, and usually have a visually captivating imagery printed onto them. When it comes to how the furniture, appliances, and everything within a house should be arranged, it would be best to seek advice from interior designers since they know very well how to get this job done. Arranging the features inside a house is not only for enhancing the appearance but also for organizing these features to allow for more space to walk around. 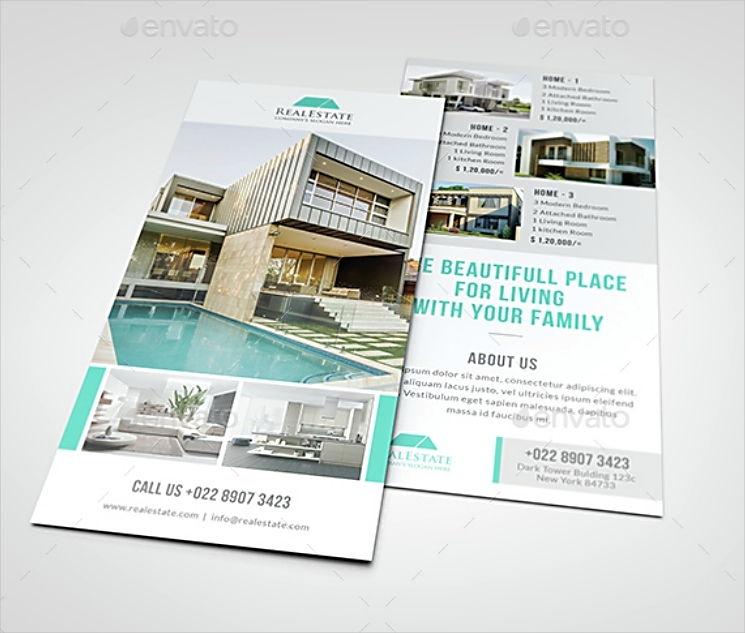 The rack card design above is intended to be used by interior designers to advertise the various services that they have to offer. For the hottest trends, check out our list of what’s trending in the world of interior designs for this year. Floral patterns are always visually appealing even to those who are not really avid fans of flowers, but then again, who doesn’t really like flowers? We can see floral patterns on floor carpets, coloring pages, and even clothes. 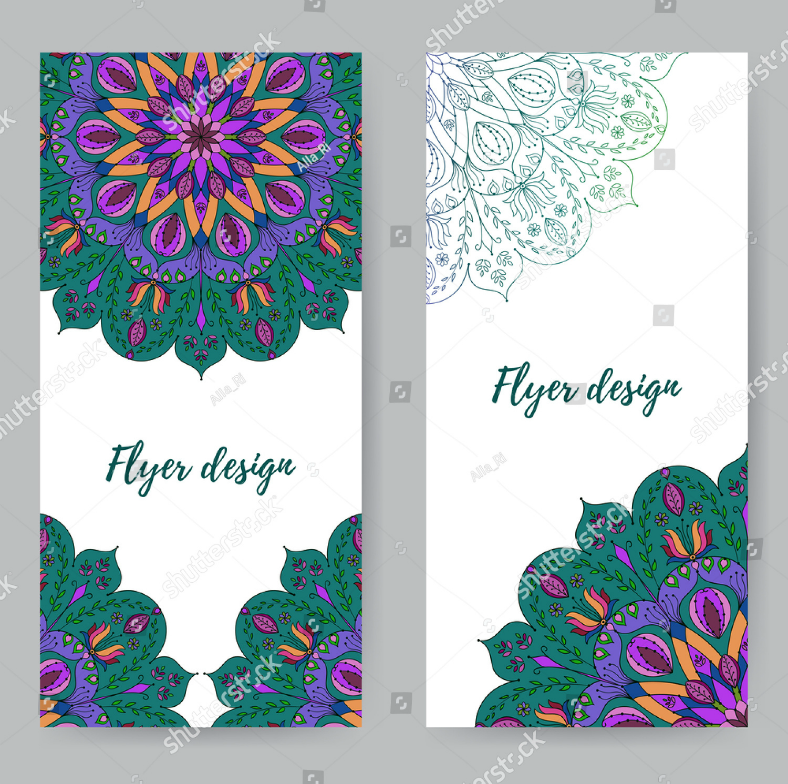 On the rack card design that we can see on top, it shows a simple-looking card with a colorful floral pattern over a plain white background. 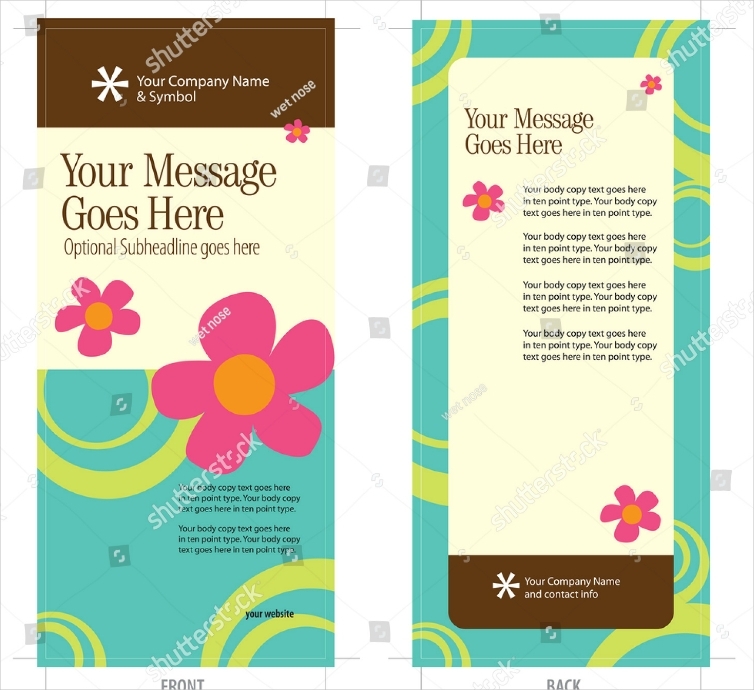 This rack card design can be used for various purposes, whether for advertising flowers or florists, or for painters or graphic artists. Being in the real estate industry is not an easy job, and this is because it usually involves a lot of money, not from the advertisers but from the prospects. No matter how well an agent advertises a property or a land, if a prospect lacks the money to purchase what was being advertised, the agent will never make a sale. To keep a real estate agent from being stressed when trying to sales talk their way to convince prospects, they can just leave either real estate brochures or rack cards in places commonly visited by people. This way, they can still continue promoting the land or property that they own without the stress. Then again, do not forget to indicate your contact details on the card. Smartphones have become smarter and better over the years with the constant evolution of technology. The same way the apps on mobile phones have constantly evolved to adapt with technology. Just like other kinds of products, you can do promotions and advertisements on the Internet, but you can also advertise your mobile apps using a rack card, and just leave copies of those cards around public places. 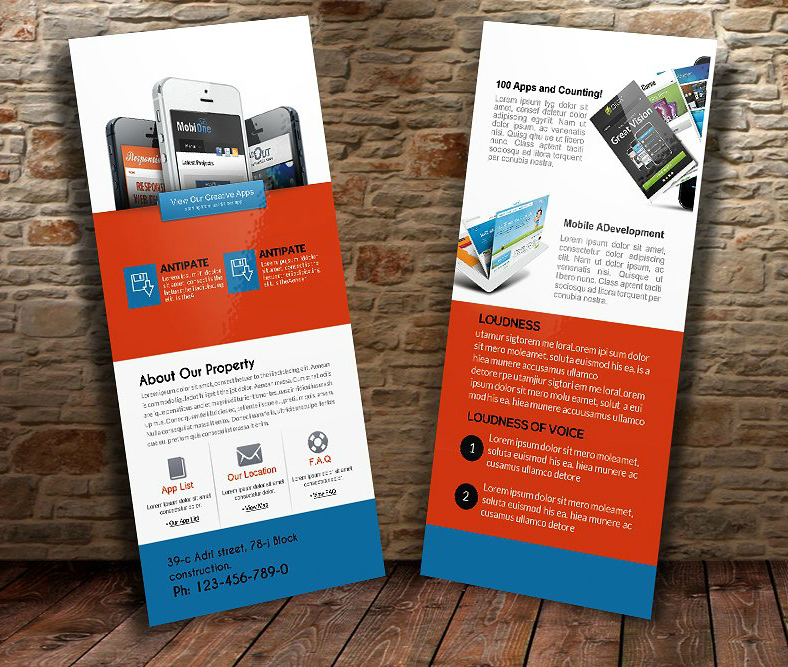 With regards to rack cards, the one on top may definitely be what you are looking for. If you can see from the sample above, each section has its own color, and this is to help organize the contents on the card and to make it easier to read. Most of the time, we find photographers that cover all kinds of events, but there are also photographers who specialize on certain kinds of events, and in this case, we are referring to wedding events. These types of photographers know when and how to shoot pictures that are able to capture the most important parts of the wedding and in a very visually stunning manner as well. 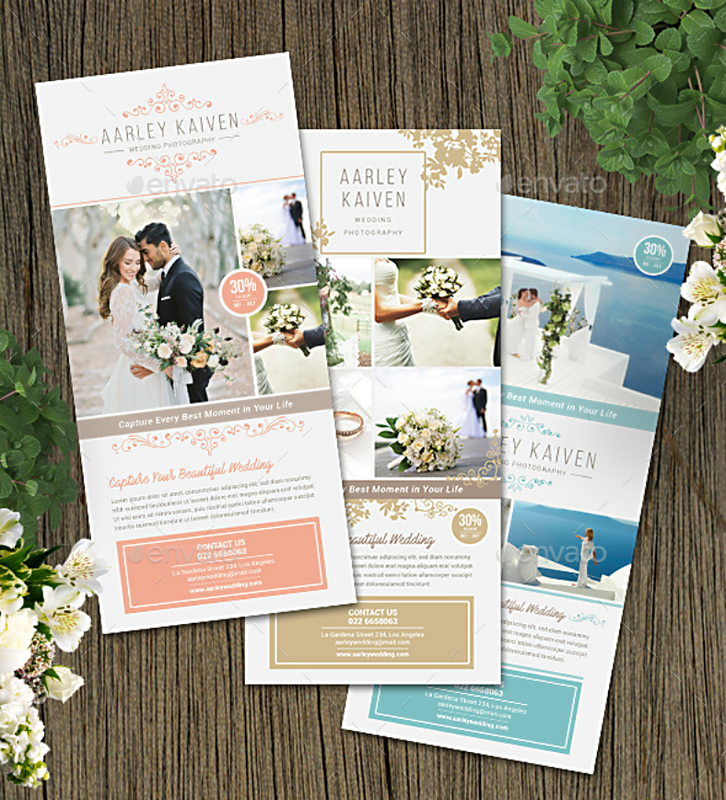 The rack card design above is for those wedding photographers who want to make their talent and skills known by the general public. As we have mentioned earlier, make sure to include only the best images on the card to effectively capture the public’s attention. 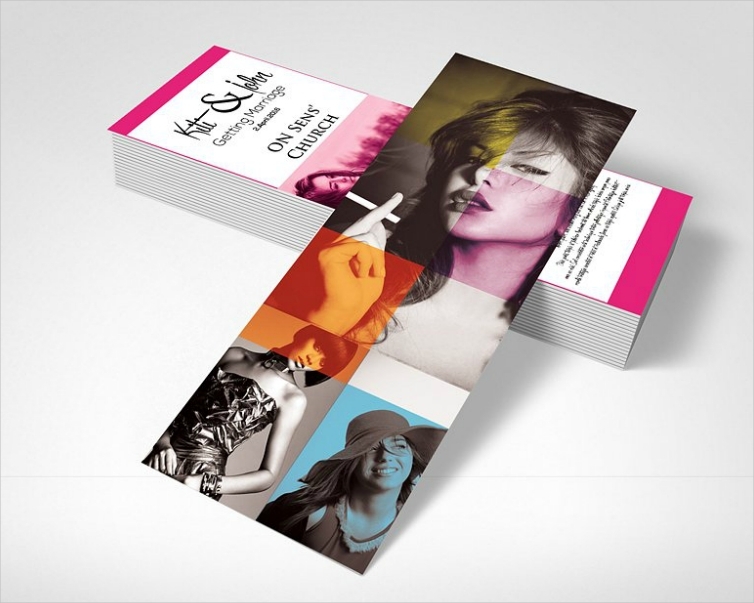 You may also want to check out our collection of photographer business cards to go along with these rack cards. Why Are Rack Cards More Useful Than Brochures? 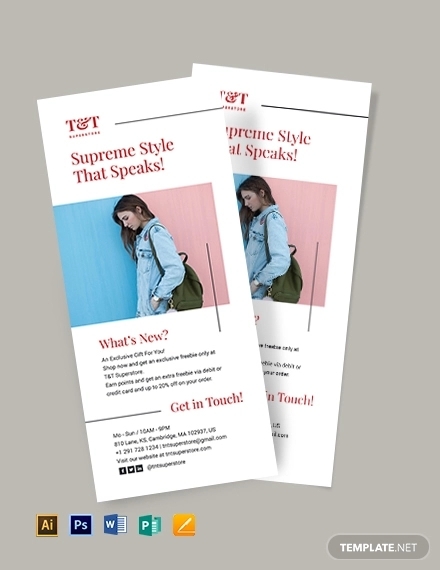 While brochures simply enumerate or mention their services in bullet-list form, rack cards place more emphasis on the important matters that readers and prospects what to know about. 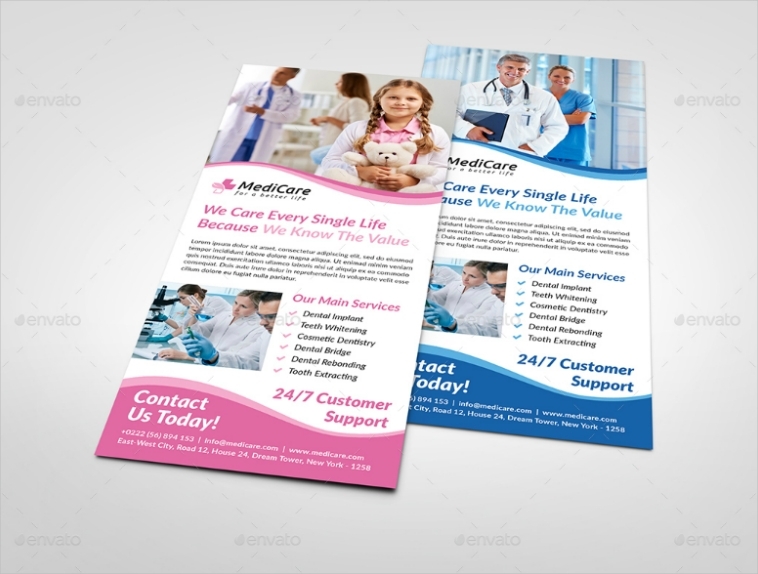 Rack cards are flexible that when changes are made in an establishment, rack cards are also able to adjust very quickly. 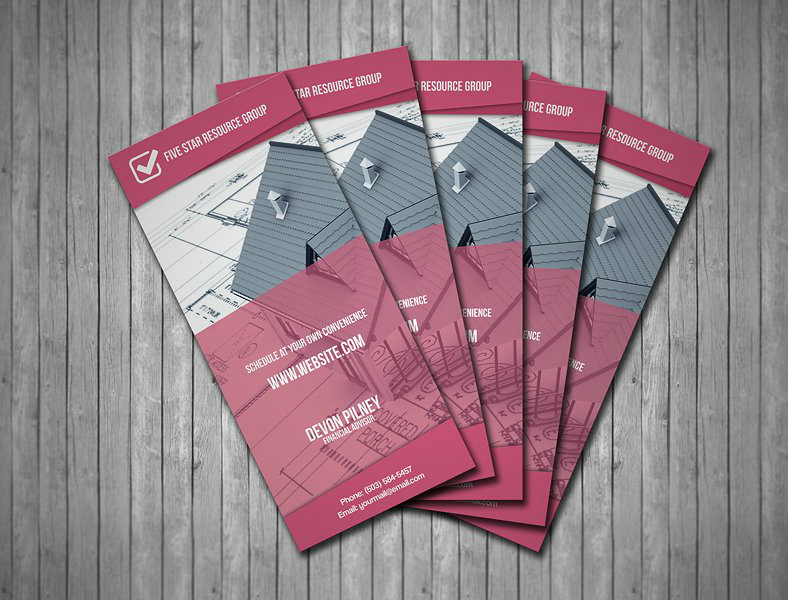 Rack cards do more than just provide information, they actually educate readers with what they need to know, and they discuss only the most important aspects. Here is another simple and straightforward rack card design that can be used for various purposes. This design makes use of both sides to maximize the amount of information that you can include. 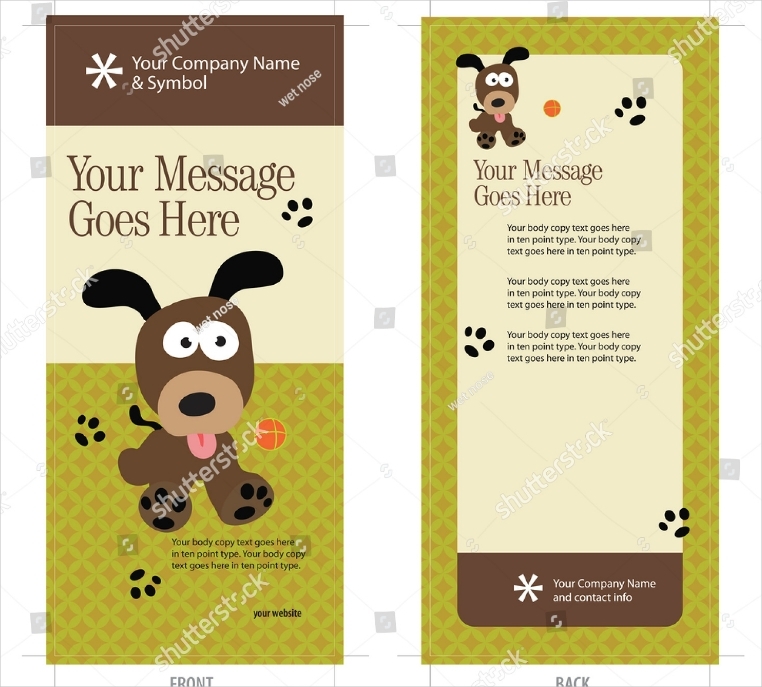 The front side of this card design is used for images and illustrations, and a few introductory content to give the reader an idea on what this rack card is about. The back side, on the other hand, is where the relevant information are located. Here, you may be able to write all the details that you want the reader to learn about your product. 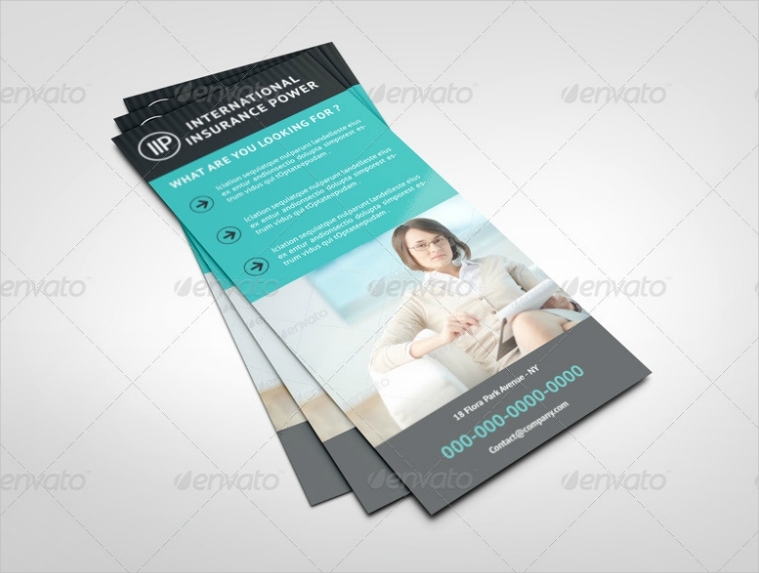 Use this rack card design to advertise items, services, or a business, it’s up to you. Pets are not just pets if you think about it very carefully; they are actually members of the family and should always be treated as one. While there are people who love others more than they love themselves, pets are far more loving than people and they give their love unconditionally. What’s even better is that pets never think only about themselves and would always put others ahead of them. That’s how much pets love others and, therefore, deserve our utmost love and compassion. 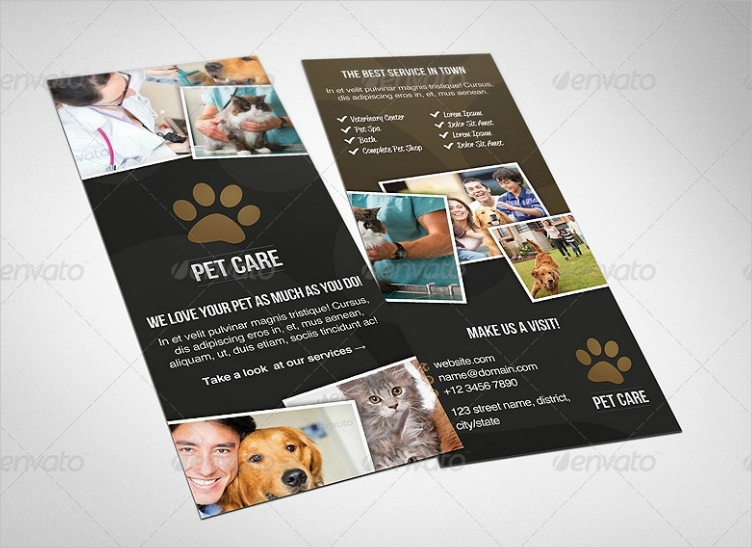 Above is a design for a rack card that can be used for professionals who specialize in providing care for your pets. 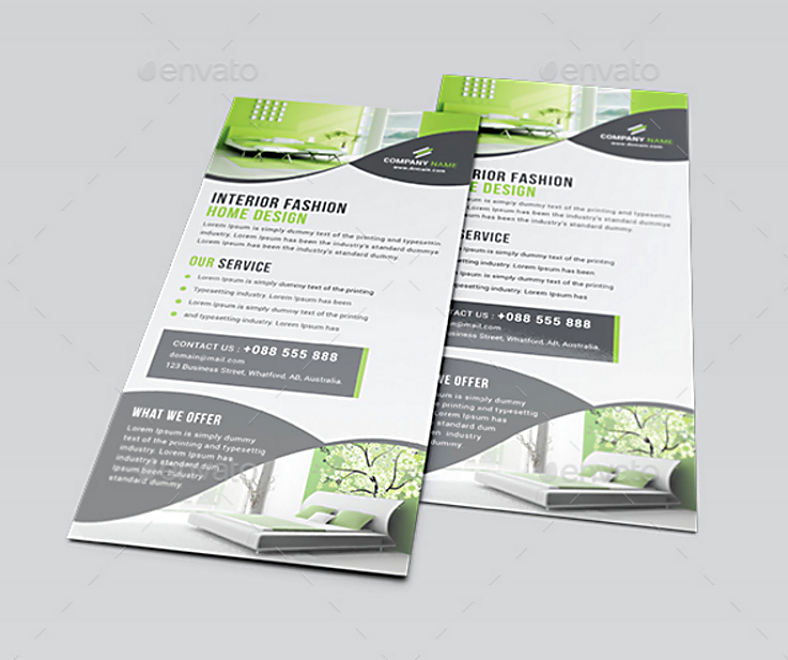 Fashion can also be advertised through rack cards as seen on the sample image above, and it can be done in a very fashionable manner as well. Just like most of the rack card designs on this list, this one makes use of both sides of the card, but unlike the others, this one uses the back side for the images and the front side for the details behind the fashion designer. With this design, don’t rely too much on how the features are being presented, also take into consideration those aspects that you are presenting, which, in this case, are the clothes. Since you are trying to advertise fashion with this rack card design, impress the prospects with the clothes and dresses that you are capable of designing. For even more related content, you may want to read about the fashion trends for the fall and winter seasons this year. 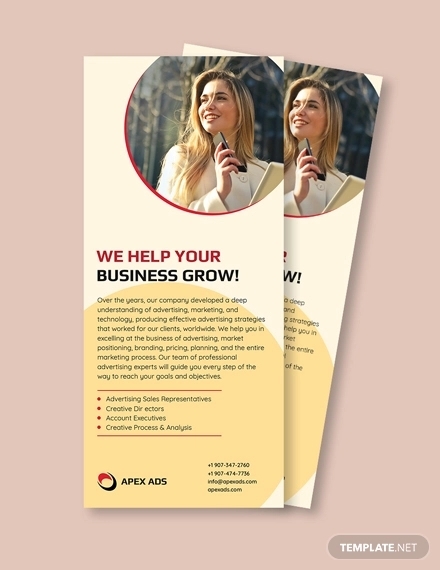 Rack cards are known to contain a lot of eye-catching graphics to attract attention from people, which is why if you are making your own rack cards, you should always maximize the use of colors, pictures, and graphics. Even with all the colors and graphics applied on the design, never forget to focus more on the content, which is the most important aspect in rack cards. Always remember the basics when making advertisement tools. Don’t ever forget to include your contact details, and always proofread before printing your cards. Lastly, a rack card to advertise not a product or a business, but an event—a summer camp, to be specific. Aside from just being different in its purpose, the orientation of this rack card is unique as well since it uses a horizontal or landscape orientation while the other designs present theirs vertically. 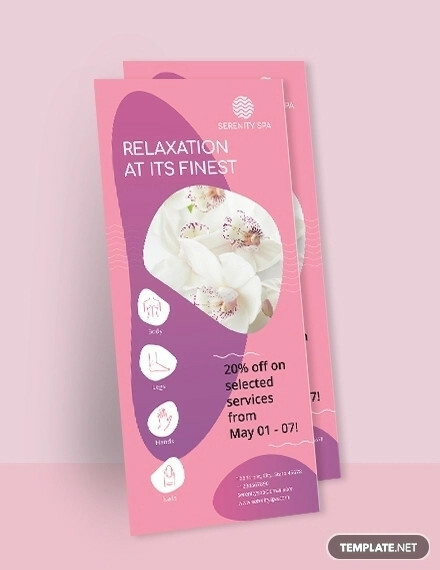 This rack card design is perfect for promoting any kind of event, but it can also be used to advertise products as well. Leave copies of this rack card in public places and rest assured that it will attract people’s attention and encourage them to take a copy. 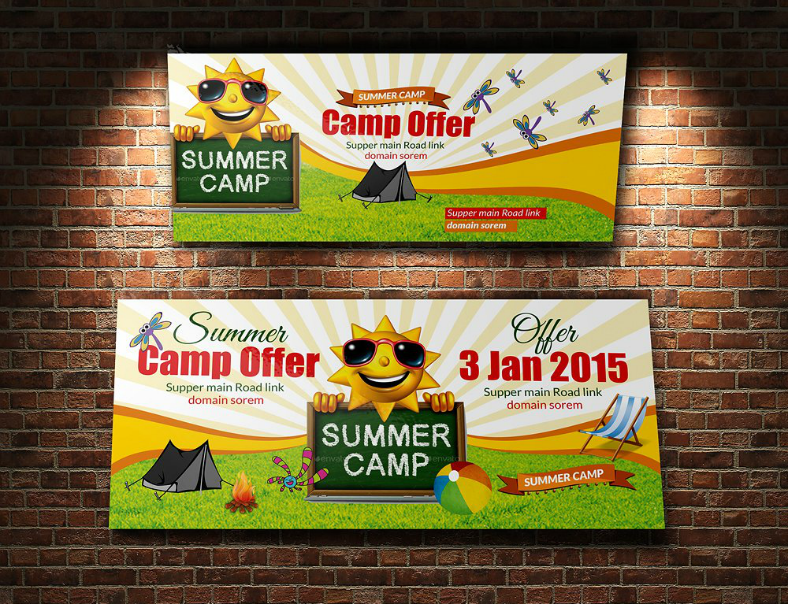 If you are planning on using flyers along with these rack card, you may check out our gallery of summer camp flyer designs. What did you think of all the rack card designs that you have just seen? We sincerely hope you were able to find at least one design that perfectly fits both your purpose and preferences. These wonderful rack card designs have been gathered from multiple websites, and we chose only the best ones from hundreds of artistic designs. And these rack card designs have been contributed by many of today’s most creative and skillful graphic artists. These designs can easily be accessed and downloaded from our websites just as long as you have a good and stable Internet connection. 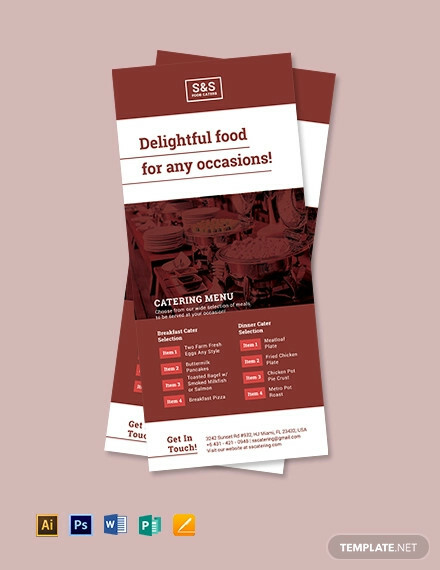 Downloading these rack card designs will require you to pay a certain amount before you can proceed to actually save the file, but these payments are of very reasonable amount, which means you won’t have to worry much about the cost. 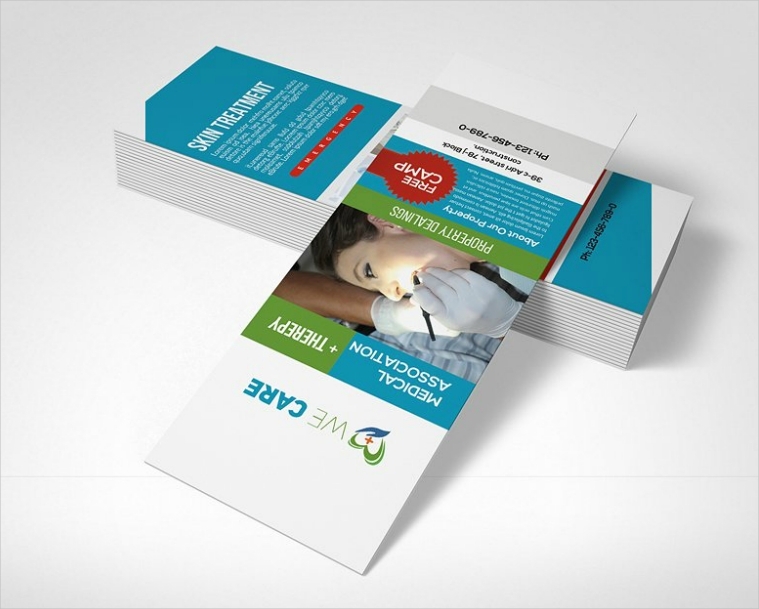 Rest assured that you will be getting more than what you are actually paying for with these rack card designs. 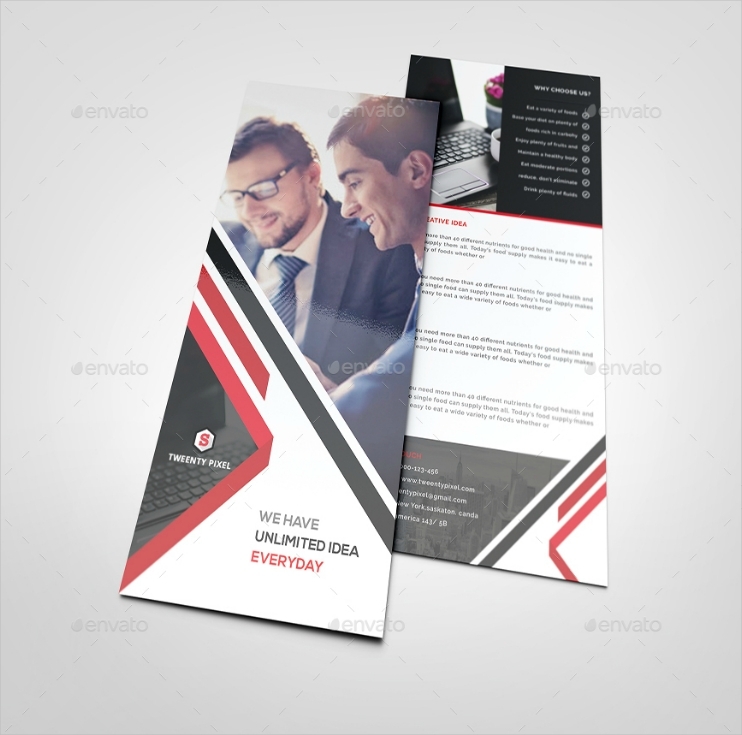 When it comes to editability, you won’t need to worry about that as well since these designs are fully customizable. 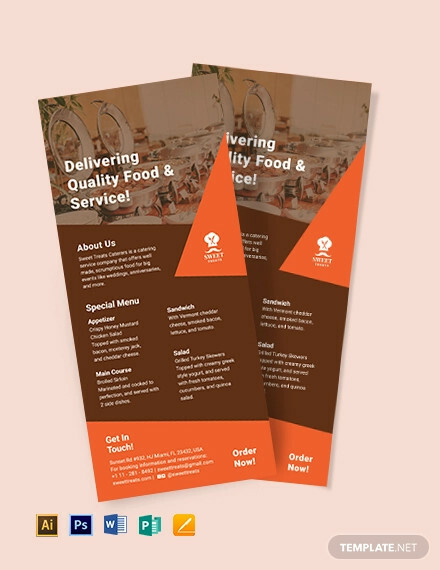 These rack card designs are in vector format, which means that editing them can be done easily and you can individualize each element, remove them, or add more depending on your preferences. Aside from just being fully editable, these designs are also able to retain their sharpness even when enlarged to a great extent. So what are you waiting for? Download a design now so you can start making your own rack cards.